Virginia Woolf knew exactly what she was talking about when she famously said ‘one cannot think well, love well, sleep well if one has not dined well’. Bringing people together to share good food and conversation is undoubtedly one of life’s simple pleasures and where better to enjoy a private dining event than with us here at The Caledonian Club? Founded in 1891 and tucked away in Belgravia, our stunning listed building is home to a varied choice of private dining spaces that can accommodate from 10 to 250 guests. 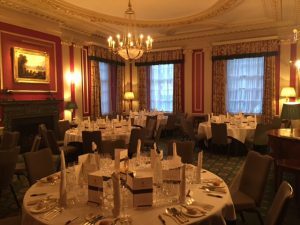 Whether you’re looking to host a corporate dinner, special celebration, or just the opportunity to bring friends, family or colleagues together in an exclusive and traditional setting – The Caledonian Club offers Scottish hospitality at its very best. The Caledonian Club are delighted to offer a complimentary glass of sparkling wine for all private dining bookings for 20 guests or more, please quote ‘PDSpring’ when enquiring.